Bonjour, y’all! Fall is in the air, and that means heartier fare. But a stick-to-your-ribs dinner doesn’t have to include gravy, potatoes, cheese, or red meat. (Um, am I craving shepherd’s pie? Another post for another day … ) Lentils are an extreme legume — very low in fat but very high in fiber and protein. They fill you up without filling you out. So have a second helping and feel just fine about it. The ingredients aren’t too far off from a lentil soup I once made. But the best part about this dish (other than the tangy flavor and protein punch) is its versatility. 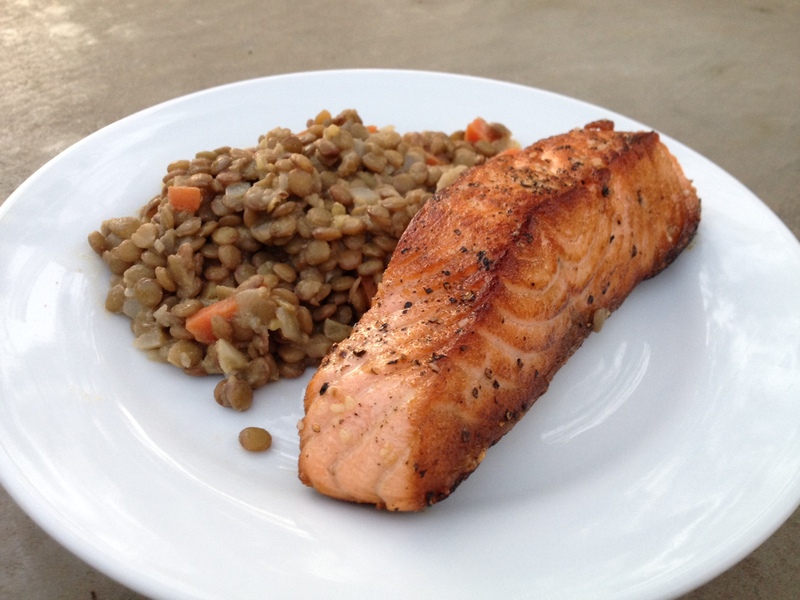 I have served these lentils alongside simple roasted salmon, atop hearty greens (like a frisée mix, which was inspired by an item on Marché’s menu last winter), or coupled with sliced grilled sausage. With options like that, the leftovers don’t last long. 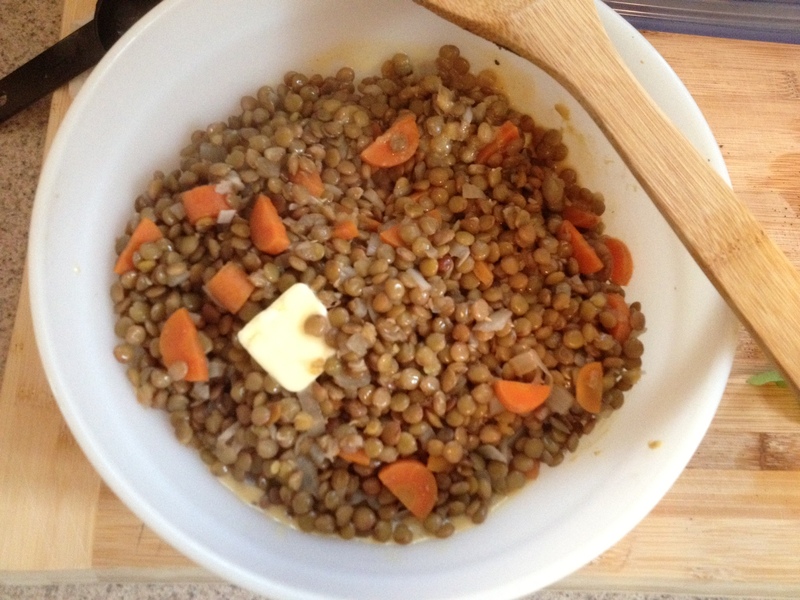 In a heat-proof bowl, cover the lentils with boiling water and set aside for 15 minutes. Heat 2 tablespoons of olive oil in a Dutch oven over medium heat. Add the onion, leeks, carrots, and celery, and cook for 5 minutes. Add the garlic and cook for another minute or two. Drain the lentils and add them to the onion mixture. Stir in the butter. Add the chicken stock and bring to a slight boil. Lower the heat and simmer, partially covered, for 20 minutes or until the lentils are tender. Most of the chicken stock will have evaporated at this point. Whisk together the remaining ¼ cup of olive oil, Dijon mustard, red wine vinegar, salt, and pepper until thoroughly combined. Add to the warm lentils, stir well, and remove the pot from the heat. Allow the lentils to cool about 10 to 15 minutes. Taste for salt and pepper and serve. Categories: Recipes, Uncategorized | Tags: ina garten, lentils | Permalink. You will LOVE it! I am sure of it.